Will JotSpot Relaunch Next Week? Google sent an email to JotSpot customers notifying them of an upgrade being rolled out over the next week. 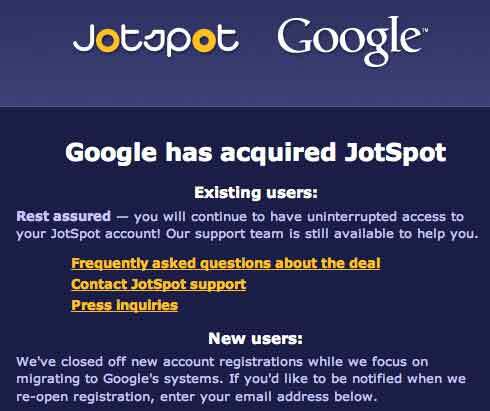 JotSpot has been closed to new customers since they were acquired by Google in late October 2006, and there has been no word of when JotSpot might be relaunched. While the email (copied below) doesn’t say that JotSpot will be relaunching to new customers, it doesn’t make much sense for JotSpot to be upgrading existing customers while they are also in the middle of integrating the software into Google’s overall platform. So, perhaps, JotSpot will be open to all again in the next week or so. Or not. automatically and no further action is necessary.